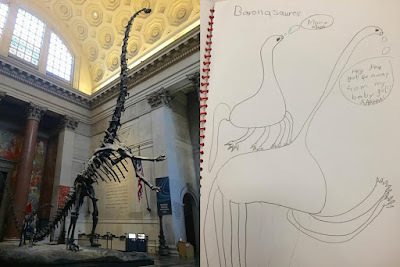 WARNING: The following post contains drawings and interpretations of adorable six-year-old kids who love dinosaurs and may cause your head to explode from utter cuteness overload. You have been warned. 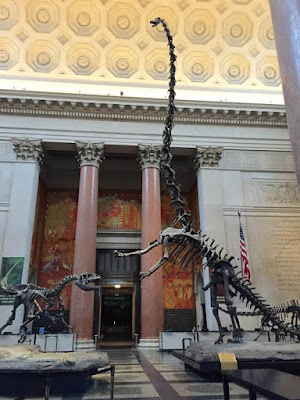 As some of you may know, I recently started working at the American Museum of Natural History in New York City. Part of my job is to interact with kids. Lots of kids. So many kids come through those doors every day and more often than not, they want to see dinosaurs. I actually overheard a little boy say to his parents as he walked in "If I don't see the dinosaurs first I am going to punch everyone in this museum." ...I can respect that! During the summer months we have day camps at the museum for various age groups. Recently we just finished up a week of paleontology-themed camp for six, seven, and eight year olds. We take them around to the exhibits before the museum opens and challenge them to come up with their own hypotheses about the fossils on display and then we compare them with what the experts believe. It's a very fulfilling experience that gives the kids a good introduction to what real paleontology is like, which is a lot of saying "we don't really know for sure!" One exhibit we take them to is probably the most dramatic in the whole museum. Its of an adult Barosaurus defending her baby from an attacking Allosaurus, by rearing up on her hind legs. When I was a kid during the 90s, shortly after this mount was erected, I felt like I was going to get a nosebleed looking up at it. It is really an awesome sight even today as an adult who has been through this entrance countless times. 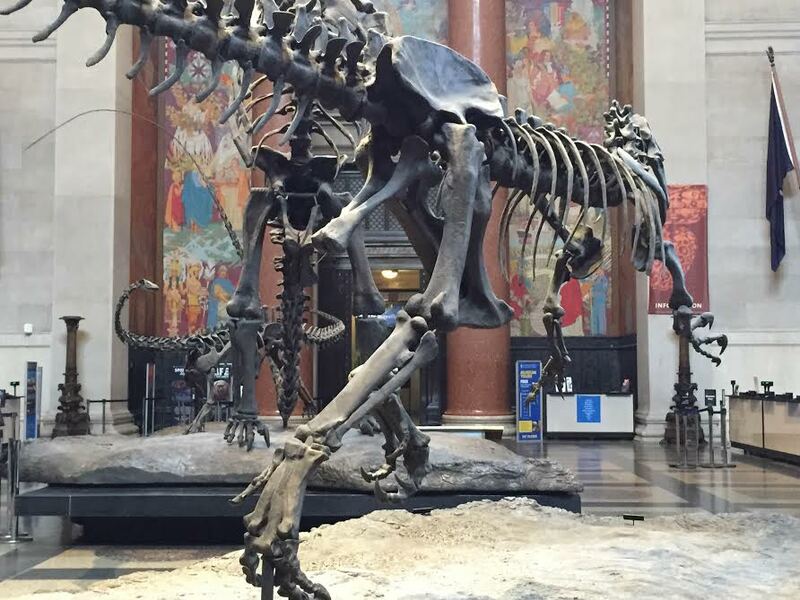 One of the perks of working here is when I arrive early before the museum opens, I can get the best pictures without the crowds of people with their stupid selfie sticks getting in the way. We asked the campers to draw or write in their notebooks what they think is going on in the scene. We don't give them too much instruction. In the field when you find a new fossil, there are NO instructions as to what it is, where it goes, or what it was for! All you have is your prior knowledge of the subject, logic, and creativity to guide you! We also allow the kids to converse with each other if they want since real scientists bounce ideas off each other all the time too. 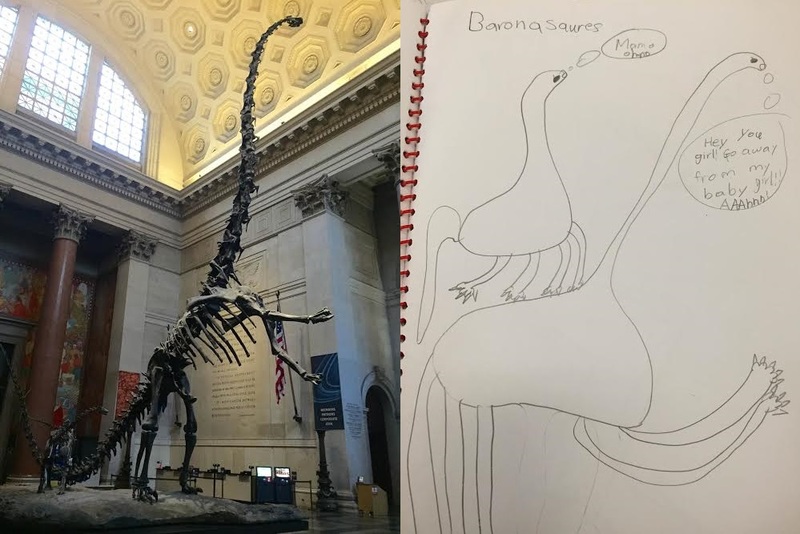 One little girl created reconstructions of both kinds of dinosaurs that really made my day. She even added dialogue! Click on the images to see a larger view! The Allosaurus was particularly threatening. Very Bold! She writes "You are going to die because I am going to KILL YOUR BABY! AAAHHHH!" But mama Barosaurus isn't taking any of the theropod's crap today. Well I hope that was enough cuteness for one day. I will be posting a lot more about my time at the museum in posts to come. Stay tuned! If this scene ever did take place, that would have been a very brave Allosaurus...or a very stupid one.